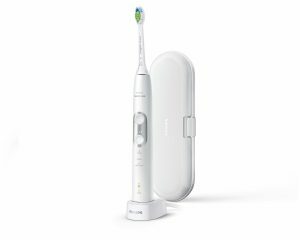 STAMFORD, Conn. – Philips Sonicare launches the new Philips Sonicare ProtectiveClean toothbrush range, its newest electric toothbrushes designed for users who want an effective, yet gentle clean. Featuring unique pressure sensors, Philips Sonicare ProtectiveClean offers three models that alert users when they are applying too much pressure, for a brushing experience that delivers healthier gums, cleaner teeth and a whiter smile. Each model features advanced sonic technology, with 31,000 brushstrokes per minute. Philips Sonicare’s unique sonic sweeping motion is carefully calibrated to create gentle microbubbles that reach deep between teeth to provide an exceptional clean feeling. All three brush heads – Optimal Plaque Control, Optimal Gum Care and DiamondClean – now feature new BrushSync technology, to notify users with a light on the handle when it’s time to swap out their brush head for maximum efficacy. A built-in microchip in the handle connects automatically with the brush head to select the optimal cleaning mode and intensity setting. For consumers who prefer a further customized brushing experience, Philips Sonicare ProtectiveClean 5100 and 6100 include three cleaning modes: Clean, Gum Care and White. Philips Sonicare ProtectiveClean 6100 is also equipped with three intensity settings. Philips Sonicare ProtectiveClean 4100 Plaque Control ($69.99), Philips Sonicare ProtectiveClean 5100 Gum Health ($89.99) and Philips Sonicare ProtectiveClean 6100 Whitening ($129.99) are now available in various colors on Philips.com and Amazon.com, as well as major retailers. Philips Sonicare ProtectiveClean 5100 and 6100 models also include a travel case so users can keep their toothbrush fully charged for an effective, yet gentle clean on the go.